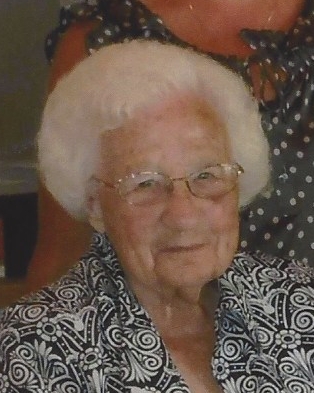 Age 99, formerly of Mason Road, Fort Loramie, passed away of natural causes early Thursday morning, November 8, 2018, at the Versailles Health Care Center in Versailles, Ohio. She was born July 28, 1919, in Burkettsville, Ohio, to the late Sebastian and Catherine (Bohman) Rindler. On July 16, 1947, at St. Bernard Catholic Church in Burkettsville, Lucille married Albert A. Hoelscher who preceded her in death on August 20, 2017. Surviving from four children are: Stanley & Cheryl Hoelscher of North Star, Karen & Robert Schwartz of Fort Loramie, Debra Hoelscher (dec.) and Beverly & John Evans of Piqua; six grandchildren: Chad & Valerie Hoelscher, Stacy & Greg O'Dell, Jason & Stacie Hoelscher, Kimberly Schwartz, Christie Evans & Scott Mowery, Brad & Alexa Evans along with nine great-grandchildren and one step great-granddaughter; one brother, Melvin Rindler of Carthagena and sisters & brothers-in law: Juliana Phlipot of Versailles, Nick & Marlene Hoelscher of Minster, Armella Albers of McCartyville, Doris Hoehne, Frank Hoehne, Cyril & Marilyn Hoelscher and James & Judy Hoelscher all of Fort Loramie and Nelson Hoelscher of Houston as well as numerous nieces and nephews. She was preceded in death by four siblings: Cletus & Delores Rindler, Viola & Andrew Moeller, Arthur & Alvina Rindler and Armella & Jerome Moeller as well as brothers & sisters-in-law: Arnold & Dorothy Hoelscher, Jerome & Patricia Hoelscher, Harold Phlipot, Raymond Albers, Urban Hoehne, Marlene Hoehne and Paul Hoelscher. Lucille was a member of St. Michael Catholic Church, St. Ann's Ladies Sodality and the Shelby County Right to Life. She had been a dedicated homemaker and enjoyed making quilts for her family. Mass of Christian Burial will be 10:30 AM, Monday, November 12, 2018, at St. Michael Church in Fort Loramie with Rev. Steven Shoup presiding. Interment will follow at St. Michael Cemetery. Friends may call Sunday 3:00 to 7:00 PM and Monday 9:00 to 10:00 AM at Gehret Funeral Home in Fort Loramie. Memorials may be made to the Fort Loramie Rescue Squad or charity of donor's choice. Private condolences may be expressed at www.gehretfuneralhome.com.